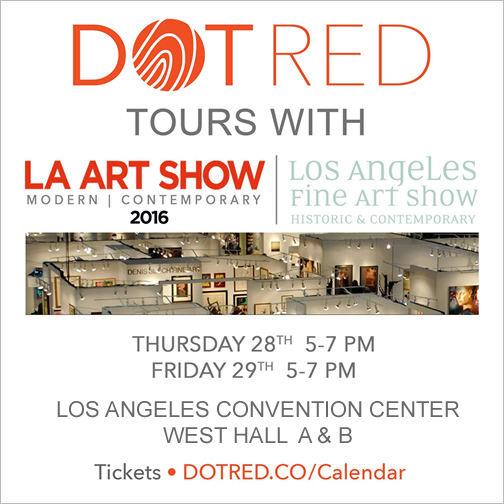 Dot Red Art Tours provides art enthusiasts, collectors, travelers, and art lovers an opportunity to experience the best art in DTLA. Jeremy Quant, Dot Red’s Founder, is a tour guide partner to organizations including the Downtown LA Art Walk and Brookfield Properties. Jeremy has worked with numerous art galleries and the Downtown community for five years. In these exclusive experiences, he shares his insider insights, highlighting some of his favorite exhibits and artists. 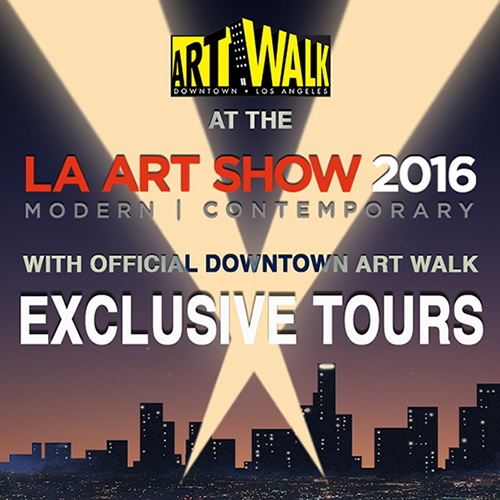 In addition to our booth, the Downtown Los Angeles Art Walk will also be offering tours to a select number of people at the LA Art Show. Similar to many of the Art Walk’s other regularly scheduled tours, like the Historic Core Mural Tour and Art & Architecture Tour, this limited time event will take art lovers on a tour of the LA Art Show’s most exciting, contemporary art exhibits. 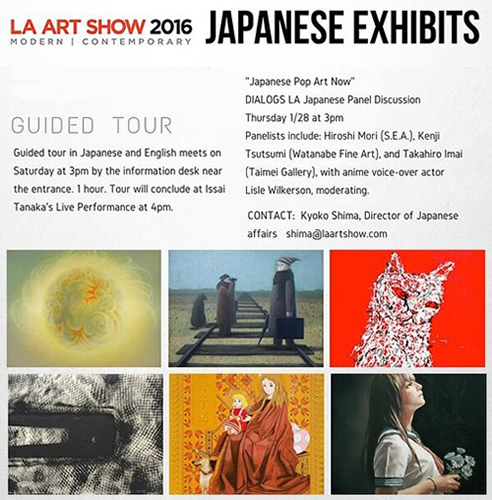 The tour will include presentations by artists and gallery representatives at several of the shows most dynamic booths includingLittletopia (Antler Gallery, Coagula Gallery, Copro Gallery, Gregorio Escalante Gallery, Think Space, etc), From the Streets to Canvas by the Mural Conservancy of Los Angeles, Dansaekhwa II Korean Monochrome Painting curated by Yoon Jin Sup, Lluís Barba’s Travelers In Time presented by Cynthia Corbett Gallery, and more! Tours, happening once per day, will be held Thursday, January 28 and Friday, January 29 from 5 to 6:30pm in West Hall A at the Los Angeles Convention Center. Sign ups for the tour must be made one hour prior to the tour at the Downtown Art Walk booth, #750. The event will be free. In recent years, Chinese Contemporary Art has been redefined by the influences from Western art and philosophy. This movement has spawned new innovative artists, pushing the boundaries of traditional mediums and experimentation. These new artist are taking on new forms, exploring the abstract, creating modern and even surreal work. Some artist seek a mutual respect with ancient Chinese traditions, while exploring a new aesthetic or philosophy . Some are even out to destroy those traditions. Each new artist is trying to discover their place on a now grand international stage. The Chinese Contemporary Art tour will offer the visitors a greater understanding of these artist and ideas. More than just a isolated movement, Chinese Contemporary Art is also influencing Western art, slowly creating a full circle. 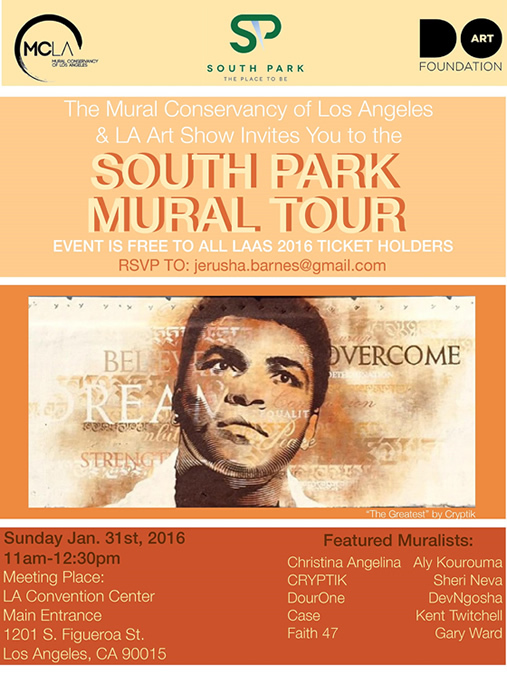 In the event that it should rain on Sunday, January 31, 2016, we will meet at the entrance of the Convention Center and Isabel Rojas-Williams (Executive Director of MCLA) will conduct a special lecture about Muralism at the Mural Conservancy of Los Angeles’ Booth #345. Attendees will enjoy live painting.